This Houston area home has a new pool house. A great space to come in out of the sun and enjoy a snack or a full meal. The columns are 6X6 powder coated steel posts. The corner of the room has stained cedar pickets to create a little privacy wall. 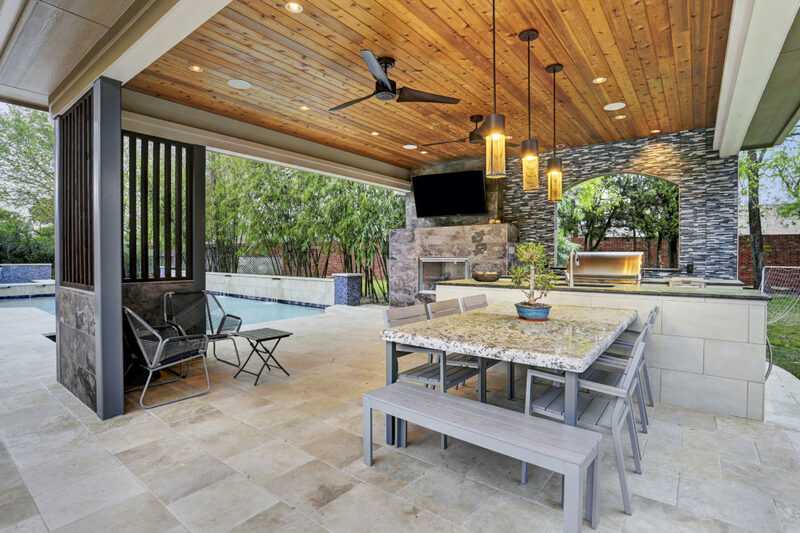 This outdoor kitchen has it all! A grill, an icemaker, 2 wine refrigerators, storage and drawers and plenty of counter space. Another view of the great kitchen area – it seamlessly transitions into the spacious backyard. This contemporary space has all it needs — a custom made dining table with steel frame legs to match the columns, a large modern fireplace with a flat screen TV above, recessed and pendant lighting and a beautiful Travertine tile floor. A small pergola was serving as a “shade” retreat … not very much shade to be had. The homeowner wanted more of a living room space and that is what they got.